견적을 문의하고 싶으신 분은 아래 글을 작성하여 보내주세요! 현창과 함께 할 사업파트너를 모십니다. 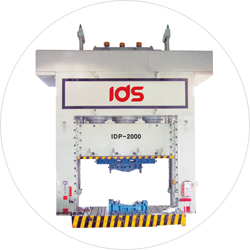 The technology of IDS is the technology of the world in the result. ※ Click for big picture. The strength and rigidity of preserves high accuracy. Separated frame block unitized by TIE ROD. Using chilled casting with sufficient surface hardness. Using high reliability and durably of hydraulic parts. Adopting various safety equipments for stability. A big stroke is possible broad molding operations. ※ We after the specification for the purpose of imprevement. copyright (c) IDS. all rights reserved.